Journeys Is Ireland The Next Great Culinary Destination? Is Ireland The Next Great Culinary Destination? Fresh produce, a commitment to traceability, and forward thinking talent have piqued the curiosity of the world's top chefs and adventurous food lovers to Ireland's West coast. How does a destination get onto the radar of the most discerning people in the culinary world? A number of elements need to come together, and this is what seems to be propelling Ireland to the top of the food chain. However, it's not just about clever marketing and the collective culinary nomads' desire for the unexplored. The secret, in Ireland's case, is quite simple: top-notch produce coupled with talent that transforms it, and a scenic location in which to savour it. When I visited Ireland in April, the first thing I did was to check the weather for the week: dry, partially cloudy with sunny spells. It must have been a case of Irish luck that spring showers would hold off for the duration of my three-day road trip through the Wild Atlantic Way. 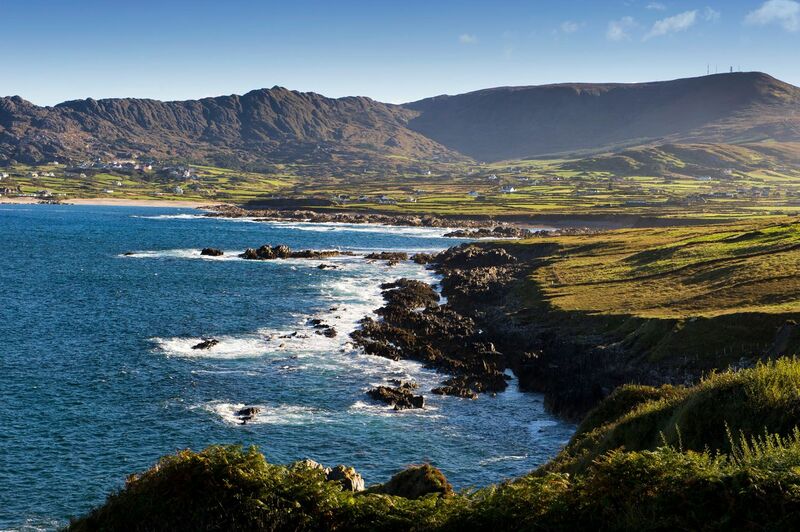 Starting from Kinsale in County Cork and running to the Inishowen Peninsula in County Donegal, the Wild Atlantic Way is a 2,500km stretch of road on the west coast of Ireland traversing countless pristine beaches and fields of green. Beautiful, rugged scenery aside, I came with another agenda: to discover Irish food and the culinary revolution taking hold on the western seaboard. Dotted with small family-run farms and home-grown restaurants that respectfully transform the fruits of the sea and land, the Wild Atlantic Way is a culinary road trip placing an emphasis on sustainability and traceability with an authentically Irish approach. The odometer read 99,050km when I left Dublin for Kenmare, a quaint holiday town located on the Ring of Kerry. I admit, there were moments that I thought I would get bored of looking at an endless expanse of green but luckily, each twist and turn revealed a different surprise. A standout was the Skellig Islands—two pyramid-like crags of rock jutting out of the Atlantic Ocean, once home to a monastery and recently made world-famous by Star Wars (the last scene of The Force Awakens was filmed there). My favourite vantage point was from the top of Valentia Island, where along with a relaxed flock of sheep, I admired the undulating curves of the Irish coast and the spectacular Skelligs rising in the foreground of the Atlantic horizon. Long drives tend to whet the appetite and I was definitely in the mood for food when I arrived in Dingle, a seaside town so charming it seemed like the backdrop for a cliche-ridden romantic comedy. Home to artisanal food brands including Murphys Ice Cream and Dingle Gin—both have achieved wide acclaim in their home country and internationally—it was a great introduction to the breadth of boutique producers who carry such pride in their trade. Almost every place we stopped at had a version of this story: a family-run food business, upholding quality over quantity, and drawing inspiration from their locality. There’s Burren Smokehouse, which crafts hot- and cold-smoked fish in the middle of the Burren region, a national park considered one of the greatest glaciokarst landscapes in the world. In Galway, I met Diarmuid Kelly of Kelly Oysters, a second-generation oyster farmer who continues the family tradition of nurturing native Irish oysters that take four years to grow. Oysters, duck and lamb are some of the produce distributed to high-end restaurants in the region, while a few artisan food brands are available locally through Inish Bia, which aims to share a fresh taste of Ireland to the world. “There has been a national shift towards food with providence at every level,” shares chef JP McMahon, a leading personality and an influential proponent of the food movement in Ireland. Based in Galway, a city with a strong farm-to-table culture, McMahon is joined by fellow chefs Enda McEvoy of Loam and Jessica Murphy of Kai to create a food community that celebrates the bounty of western Ireland in a creative, modern way. McMahon’s terroir-based restaurant Aniar lists every single farm he sources from—there are 26 suppliers on the menu—and he readily admits that cooking is made easy given the calibre of the ingredients available to him. “There are initiatives such as Good Food Ireland, a member’s association that you join based on your suppliers, the Irish government’s Origin Green project, and Eurotoques as well,” he shares, all of which are indicative of how mature the entire movement has become. However, he insists there is still a lot of work to be done to brand Irish produce and increase awareness about Irish cuisine. In 2015, McMahon founded Food on the Edge, an annual food congress that showcases the region to chefs and food lovers from around the world. “In the first year, Albert Adrià (of now-defunct elBulli) was surprised to find that we have amazing seafood. Sometimes chefs don’t realise that we’re on the edge of the Atlantic and surrounded by all these natural riches,” he says. There is immense interest in the symposium, with last year’s star-studded lineup—Massimo Bottura of Osteria Francescana and Virgilio Martínez of Central, to name a few, presented—eclipsed by the sheer number of chefs attending the 2017 instalment. To date, there are 54 confirmed chef-speakers attending the event this October. More than ever, gourmands go the distance in the search for hyperlocal cuisine—the success of Magnus Nilsson’s Fäviken in northern Sweden and the recently concluded pop-up of Noma in a forest in Tulum, Mexico proves that many travel far and wide just to experience something they cannot eat anywhere else. This is exactly what the Wild Atlantic Way in Ireland offers: a gastronomic adventure rooted in nature, a movement that organically evolved from the genuine passion of farmers, chefs and food lovers. The Irish may have waited for their culinary moment in the sun, but just like the six steps to pour the perfect pint of Guinness—and full five-minute pause before it is ready to drink—good things come to those who wait. And for those willing to take a scenic drive in the wilds of west Ireland, good food certainly awaits.